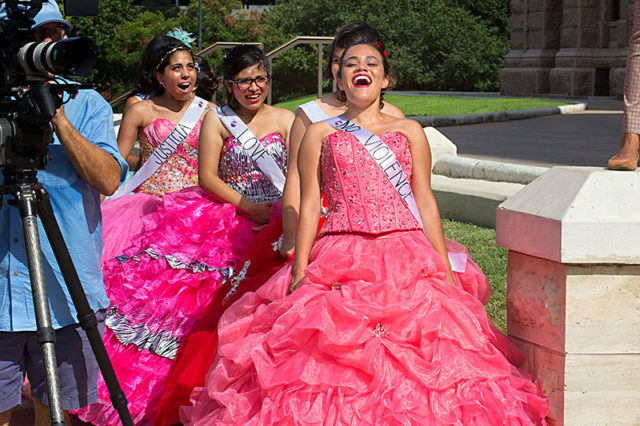 g Latina women chose an unlikely spot to hold their quinceañera – a significant tradition marking a Latina’s transition to adulthood. For them, the point wasn’t to revel in the festivities, but to send a serious message to lawmakers: Texas is our home, and we’re not going to back down, no matter how hard you try to push us away. Latinos currently com­prise nearly 50% of Tex­ans under 19 years old. The law punishing so-called “sanctuary cities” allows police officers to inquire about the citizenship status of anyone they pull over, and forces local law enforcement to comply with (currently voluntary) U.S. Immigration and Customs Enforcement detainer requests. Barring a court injunction in the next two days, the “papers please”-style law will go into effect on Friday, Sept. 1. * (SB 4 was blocked in courts late Wednesday; see update at end of article.) But while SB 4 has instilled fear and anxiety in the local immigrant community (“Into the Shadows,” July 21), it’s also served as a rallying cry to galvanize Latinos and prompt creative acts of resistance. The latest radical act, the quince protest – which drew national attention and attracted millions of online viewers – is the brainchild of Jolt, a scrappy new organization with big ambition. Working out of a compact office in East Austin, Jolt seeks to mobilize the Latino vote, build community and cultural pride, and drive an issue-based agenda. It wasn’t yet ready for prime time when it launched in November (the group didn’t even have an office until February), but the election of Donald Trump – and his demonization of immigrant Mexicans as criminals and rapists and his calls for a border wall – forced the group into early action. In fact, Jolt planned to slowly roll out with a completely different priority agenda focused first on educational issues, with the assumption their chance for immigration reform would be feasible with a Hillary Clinton presidency. But the surprise election results swung the focal point to racial justice and immigration. Women lead the small staff, comprised of two full-time and three part-time workers, with Cristina Tzintzún at the helm. Growing up in Ohio as the daughter of a darker-skinned Mexican immigrant mother and a white “American hippie” father, Tzin­tzún saw the striking differences between how she and her siblings were treated when they’d go out with her mother vs. her father. “The privilege of growing up in the U.S. also came with great responsibility of addressing the inequities we saw,” she said. Toward the end of her tenure there, Tzintzún had developed a few important takeaways: that “to really win immigration reform, to win full equality for Latinos, we also need to build and consolidate our power electorally if we want to actually enact change long-term.” She left WDP in 2015 for a brief stint at the Service Employ­ees International Union in D.C. to figure out how to do just that. Missing Texas “desperately” and realizing power comes from the states, she soon after returned to Austin, energized to begin her next venture. Jolt intentionally began during an off-election year with the intent to grow a base that could mobilize and sustain voters in time for the 2018 election. They’ve set up staff in key metro areas (Jolt is currently expanding into Dallas) and recently launched a digital tool kit; the rollout of high school and college chapters; and a young adult union, allowing participants to aggregate power across the state much more quickly. While finances pose a challenge for the nascent nonprofit, it’s raised $280,000 to date. (Tzintzún is an unpaid volunteer who generates income through consulting work.) Jolt claims more than 200 all-Latino members in Austin and 15,000 statewide, who range from fifth-generation Texans to the undocumented. The organization isn’t just interested in drawing people to politics, but in sharing Latino culture, music, and art – a characteristic that distinguishes it from other groups with similar goals. A Capitol youth rally planned for Sept. 1 will feature “lucha libre” wrestlers who will “fight for justice and equality” while a hairdresser buzzes symbols like a clasped fist of solidarity into folks’ hair, if willing. Jolt is far from the first group to set its sights on turning Texas blue. Most recently, in 2013, the Obama-affiliated Battleground Texas sought to make Texas a competitive swing state by knocking on doors, registering voters, and deputizing volunteers to boost Democratic Party voting among minorities and white women. However, enmeshing itself with Wendy Davis’ 2014 bid for governor, which suffered defeat to Gov. Greg Abbott by 20 points – seven points worse than previous contender Bill White ­– led to high-profile criticism and reports of strained relationships with some of the state’s Democratic candidates. Faulty and exaggerated early voting turnout memos, a late-term investment in training Latino leaders, and the out-of-state team’s initial ignorance in navigating Texas’ voter laws didn’t help either. Tzintzún believes SB 4 has reinvigorated Latino activism. 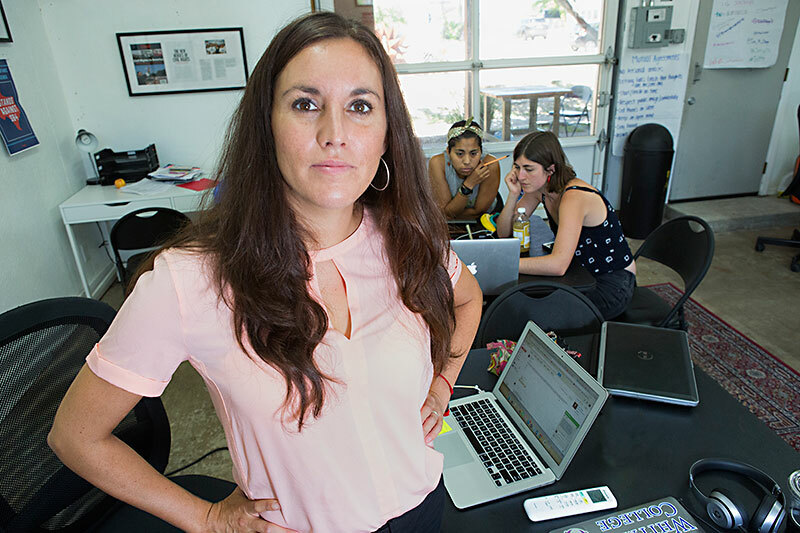 Without specifically calling out Battle­ground or any other group, Tzintzún maintains that Jolt’s strategy is unique to previous attempts in that it’s heavily focused on Latino youth, with the belief young citizens are entirely capable of self-organizing throughout the year. Latinos currently comprise nearly 50% of Texans under 19 years old, and one-third of Hispanic eligible voters in Texas are between 18-29 years old: That’s potential for a sizable army. And Attorney General Ken Paxton’s attack on “DREAMers,” or recipients of DACA, the Deferred Action for Child­­hood Arrivals two-year work and study program (of which Tzintzún’s husband counts himself) that protects young undocumented residents, has revved up activism as well. Paxton has taken an even harsher approach to DACA than extremist President Trump – and has threatened to sue the president if he doesn’t rescind the program – a prime example of the state’s harsh anti-immigrant fervor. Immigration tops the list, according to Latino Decisions’ polling of Hispanic Tex­ans. Staring in the face of SB 4, a threat to not just the undocumented but to all Latinos who can now be racially profiled and discriminated against because of the color of their skin, Tzintzún believes the issue has reinvigorated Latino activism. “For us, SB 4 is really a call to action to defend our community from a hateful, discriminatory agenda,” said Tzintzún.